How does rounding for the Time Clock work? 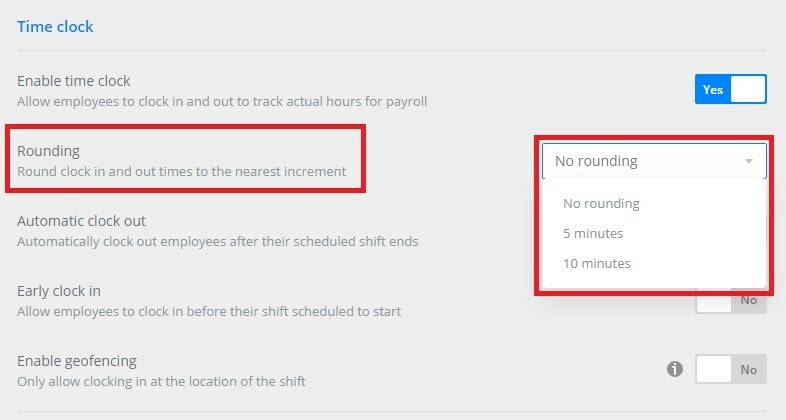 Custom rounding of employees' time clock punches allows you to round timestamps to the nearest increment for simplicity of payroll calculations. For example, clocking in at 11:03 AM would be recorded as 11:05 AM or clocking out at 6:56 PM would be recorded as 6:55 PM when the nearest increment is set for 5 minutes. To enable this feature, go to your Company Settings and scroll to the Time Clock section. Simply choose whichever increment you prefer, and employees' punches will be adjusted automatically.